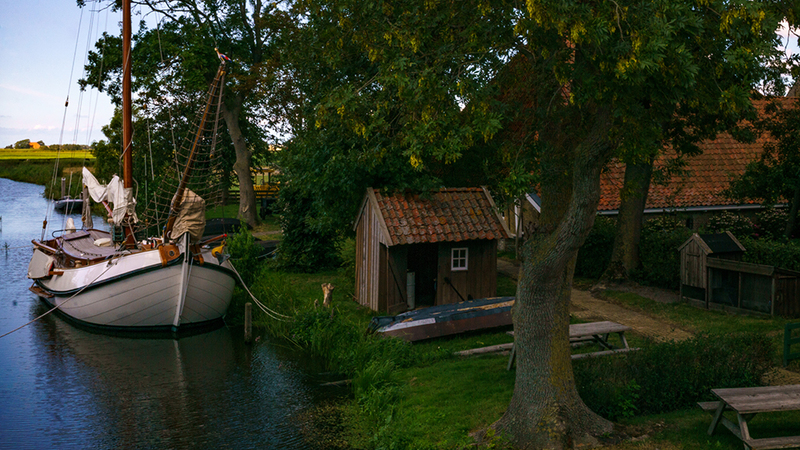 Allingawier is a beautiful open-air museum in Friesland, The Netherlands. And one you must visit. One of the most beautiful open-air museums of The Netherlands can be found in Friesland. To be more precise, in Allingawier. Allingawier is a museum village of the old, Frisian life in Allingawier. If you’re interested in knowing more about one of my most favourite open-air museums in The Netherlands, continue reading. The museum in Allingawier, Friesland is a biography of a Frisian village, in the area of Allingawier, during the 19th century. The open-air museum in Allingawier shows its visitors around the old fisherman’s village of Allingawier, The Netherlands. When I visited I was surprised how preserved everything was. There are so many authentic buildings that you don’t know where to look. Before you arrive at the village of Allingawier you notice the endless meadows, the cows and the sheep on the fields. But, barely any houses. Even though you’re arriving in a museum village in Allingawier, your surroundings are calm. There are not many people that visit the open-air village of Allingawier, Friesland. And why? My reasoning is that people simply don’t know of this museum in The Netherlands yet. The museum in Allingawier has an original 17th-century farm, a bakery, a blacksmith and plenty of more incredible sights. Back in the days, it was located at the Makkumermeer, a lake. However, as you can see when you arrive, this is not the case anymore. But, maybe one day, the lake will return. Recreating the lake and nature is now placed on the political agenda, so if you return in 30 years, maybe the area will look completely different than now. 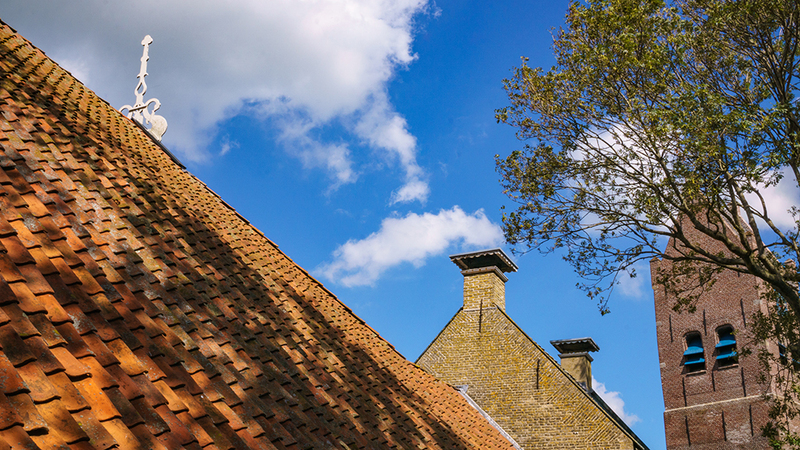 At Allingawier you can discover a museum village of the old, Frisian life. During the opening times, there are craftsmen, who are all volunteers, that show off their skills to the visitors in the local shops. While they are working on their craft the locals will tell you about the time when the village of Allingawier, The Netherlands was self-sufficient. The craftsmen and craftswomen will give you information on the work they are doing. But also on the materials that are used. If you want to experience the life of Dutch people in the 19th century, in this region, then this museum is a must visit in Friesland. When I walked through the museum of Allingawier I noticed a woman who was spinning yarn. As she continued spinning I asked her questions about the wool, the methods and about herself. Turned out the wool came from a local farmer, a few houses back. The sheep that the wool came from were standing in the meadows as we continued talking. 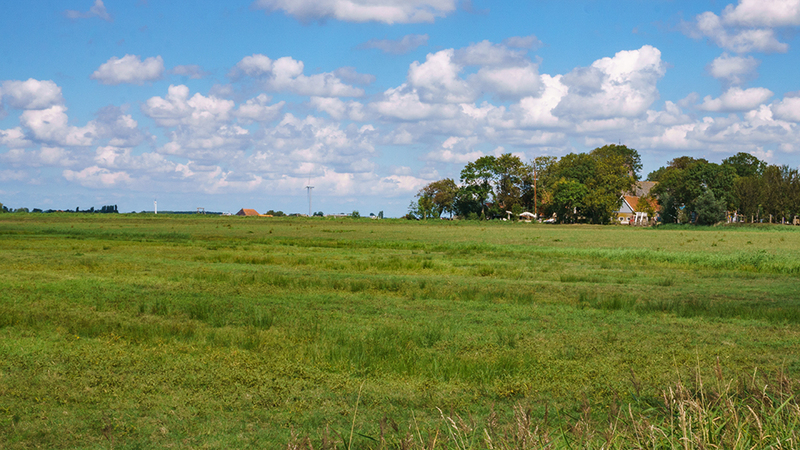 She was actually from a city in Noord-Holland but moved to Friesland for the beautiful and wide view of the meadows. She also told me how the open-air museum in Friesland, The Netherlands survives on the income of the entry fee and of a foundation. The museum of Allingawier doesn’t get any subsidy from the government, whatsoever. This means volunteers are very important, but so are visitors. When I visited the open-air museum in Friesland, The Netherlands there were plastic cards with information on them, only in Dutch. However, as I talked to the woman who was spinning yarn, they are making the museum of Allingawier more international. That means that they are trying to translate everything so foreign visitors can enjoy this museum too. But, I don’t know how long that takes. Just to be sure, download Google Translate with the live translation button so you can understand the main idea. This museum is one of the best museums in The Netherlands, mainly because it is so specific of this certain region of Friesland. 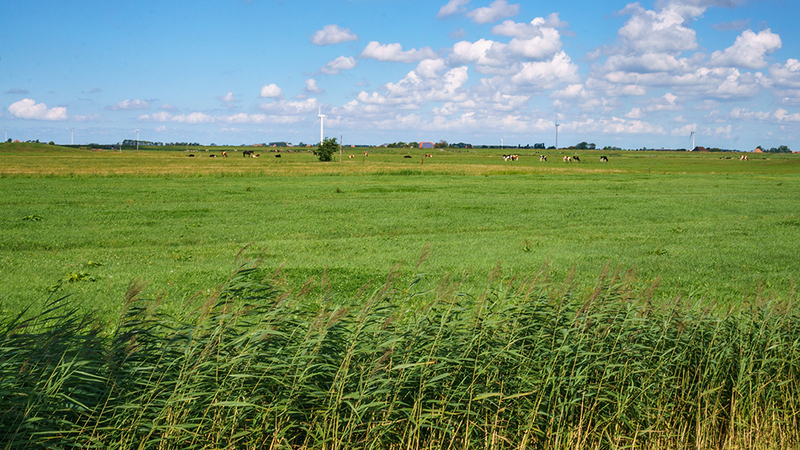 The next region of Friesland is completely different. I absolutely love this open-air museum in The Netherlands which can be visited as a day trip from Leeuwarden and Bolsward. The open-air museum of Allingawier opens from Tuesday-Sunday from 10:00-17:00. The entry is 4,50 euros. Kids below 12 are free. The toilet is invalid friendly, but, keep in mind that the rest of the village of Allingawier is old. There are old, typical Frisian cobblestones that need to be crossed. The museum can be opened on other days for events, such as weddings, or business meetings. In that case, you’d have to send an email to the people of the museum. If you are coming with a big group, workshops can be organized, such as sailing on traditional boats or workshops at the blacksmith. The best way to get to this open-air museum in Allingawier is to take the intercity from Amsterdam Centraal to station Alkmaar. From Alkmaar take the bus 350 to Leeuwarden bus station. Get out at bushalte Kop Afsluitdijk, Zurich. Take bus 90 in the direction of Heerenveen via Sneek. Get out at Bolsward bus station. From here you have to call a special bus to take you to Allingawier. Check 9292.nl for all the information. There is a normal bus to Allingawier, that you don’t have to call, however, that one only runs early mornings and at the end of the afternoon. This will take you around 3 hours one way. Take the intercity in the direction of Leeuwarden. Get out at Leeuwarden. Take bus 92 in the direction of Bolsward via Winsum. Get out at bus station Bolsward. From here you have to call a special bus to take you to Allingawier. Check 9292.nl for all the information. There is a normal bus to Allingawier, that you don’t have to call, however, that one only runs early mornings and at the end of the afternoon. This will take you around 3 hours one way. From Leeuwarden to Allingawier you have several options. My favourite options are to either take bus 192 in the direction of Bolsward and from there take bus 96 Bolsward via Makkum and get out at Allingawier (but only mornings and afternoons, check 9292.nl for the exact times). Or, take the train from Leeuwarden in the direction of Stavoren and get out at Workum. From Workum take bus 102 from station Workum in the direction of Makkum Sporthal. Ask the bus driver if he can drop you off at the intersection, as you need to go to Allingawier and not to Idsegahuizum. It takes you anywhere between 50 minutes and 1 hour and a half minutes to get to Allingawier from Leeuwarden by public transport. Almost all buses run once an hour, keep that in mind. Have you ever been to the open-air museum of Allingawier, The Netherlands? Or to any other open-air museum within The Netherlands? What did you think of it? Are you interested in more day trips from Leeuwarden, click here? For information on how to spend a day in Bolsward, The Netherlands, have a look at an article right here.